Actor Jussie Smollett's claims of being the victim of a horrific hate crime last month are beginning to come apart, but that didn't stop national press members from reacting with painful credulity at the outset of what was always an implausible tale. Smollett claimed he was attacked by two men in January who recognized him from his Fox show "Empire," in the middle of the night in an affluent Chicago neighborhood with temperatures around zero degrees. He said they beat him up, yelled racist and homophobic slurs, put a rope around his neck, poured bleach on him and then ran off. He also said they yelled "This is MAGA country" at him, to indicate the assailants were supporters of President Donald Trump. Now, investigators have reason to believe Smollett orchestrated the attack himself and the entire thing was an elaborate hoax, although the entertainer maintains he is a victim. Yet at the time of the incident, newscasts played up the "brutal" attack and some news chyrons blindly accepted Smollett's turn of events, such as one from MSNBC that read "Breaking News: ‘Empire' Star Jussie Smollett attacked in Chicago by men hurling racist and homophobic slurs." MSNBC's Stephanie Ruhle mourned the "horrible" assault, while CNN's Brooke Baldwin intoned, "This is America in 2019," adding the details were "absolutely despicable." E! 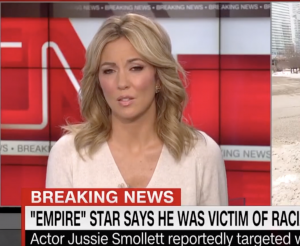 News personalities reacted in horror at the "stomach-churning" details of the attack, and one "Entertainment Tonight" reporter said at the conclusion of one of his segments that his "prayers were with Jussie." ABC News host Robin Roberts interviewed Smollett last week for "Good Morning America" and asked such softball questions that one CNN analyst said later it "was a celebrity interview more than a news person interview." "It's been two weeks since that night left actor Jussie Smollett bruised but not broken, and he's still processing the raw emotions," Roberts said over footage of Smollett wiping away tears with a tissue. Smollett reiterated during the interview that the nature of his attack was political, saying it was because he comes "really hard at 45," a reference to Trump being the 45th president. He cried several times and said he couldn't bear the idea his attackers wouldn't be brought to justice. Chicago Police now believe Smollett paid two men to orchestrate the assault, according to law enforcement sources who spoke to CNN. The initial media reaction was worse on Twitter. Mediaite compiled dozens of media members who repeated Smollett's account and often tied it to the culture of Trump's politics. In contrast, local Chicago reporters have dug into the story since it began. Cracks were subsequently exposed in Smollett's story, and the police turned their investigation around. The initial reaction was even more stark in the 2020 White House race, with Democratic presidential candidates and other progressive politicians immediately tweeting out their horror and condemnation of the purported attack. Trump also called the attack terrible when asked about it at the White House. Only now are some hopefuls like Sens. Kamala Harris (D., Calif.) and Cory Booker (D., N.J.) saying they want to wait for all the facts before commenting further. If only the national press were this incredulous in the first place.